The timber framing industry is no stranger to kit companies and stock plans. Many companies who offer these stock plans also provide an estimated price for the timber frame package. Because the Riverbend website showcases floor plan concepts, we are often asked why we do not offer kit or stock pricing; this article is meant to give you some insight as to why. In general, stock floor plans are pre-drawn and are not meant to be modified beyond their basic footprint or timber frame structure. Companies often offer stock plans because it creates less detail work for them and a faster build cycle. For some homebuilders, these aspects might fit perfectly with their needs. Stock plans also offer you the foreknowledge of an exact price for the timber kit, although this price does not include all of your additional costs that come with building a home. If you choose a stock plan that you think works best for you, some changes can be made to these plans depending on the company, but they are usually minor and do not affect the price of the timber package. Where stock plans offer ready-made plans and set kit prices, a floor plan concept is intended to inspire your own ideas for a custom home. 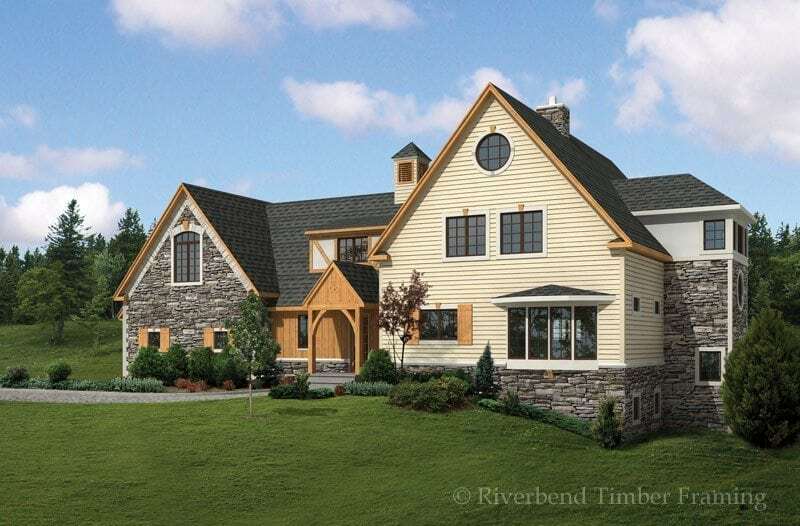 Conceptual plans are a springboard for virtually limitless options on how you want your timber home to look, including the density and style of your timber frame structure. While we share several floor plans on our website, these are concepts, not kits. Whether you draw inspiration from past projects or come up with something completely new, a conceptual plan can only be limited by your creativity, budget and engineering regulations. Here at Riverbend, we believe that designing to a turnkey budget is more important than quoting a portion of your total cost, such as the timber package. Our turnkey, whole-home approach gives more accurate estimations of what kind of impact your design choices have on the cost to build your home. Ultimately, by customizing your project, you are more likely to create a home that is aesthetically pleasing, unique to your family legacy and within your overall budget. No two people are exactly alike and the same should be said for timber frame homes. By giving the benefit of choice and the opportunity to express personal style, a custom-made home offers a deeper connection between it, the surrounding land and the homebuilder that cannot be replicated anywhere else.